Side to side sloping campground spaces are unfortunately quite common. Here we are near Conway, Arkansas, down by the river and this was our assigned space. That is our “new” ‘96 F350 Diesel crew cab dually in the foreground and an Americana SKP model . . . . leveled, on the camping site. Without backing up over wood blocks, the unique Americana leveling air-ride, adjusted this situation! We simply pumped up the low side (to the right) and let the “air” out of the high side (to the left). It has taken many years to find a trailer suspension that could offer more benefits than the Alko trailing arm “rubber in compression” design, standard on Americana models. We have used the Alko suspension because it didn’t wear out, didn’t break and gave the trailer a significantly better ride than standard springs.. However, we are always on the look-out for a better mouse trap. The trucking industry has moved almost entirely to air-ride suspension on their tow vehicles and trailers, as it gives a more comfortable and less fatiguing ride for the driver, and a trailer ride which does not destroy the cargo. Furniture vans were the first big proponents of air-ride. Delicate cargos such as strawberries also enjoy the benefits of air-ride. Nothing like having a strawberry cargo turn to juice before reaching the market. Towing dynamic and variable load adjustability plus a smoother ride have been the result of air-ride development and technology. 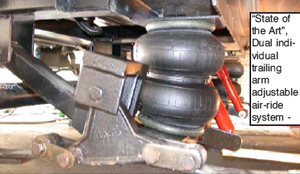 The interstate highway system has also benefited from the airride’s softer suspension. With air-ride appearing on almost 100% of the over-the-road commercial truck/trailer fleet, the highways are not being subjected to such a beating. We have decided to take advantage of the air-ride’s state of the art technology and have adapted the now proven systems to our Americana models and are making the system available to our Americana model fifthwheel customers. The system does cost more than our standard Alko suspension, so we are offering airride as an upgrade option. Americana now offers some advanced technology options not available on any other 4 seasons built fifthwheel in our price range ie. hydraulic disc brakes and the adjustable air-ride suspension. The air-ride system will adjust left and right for balanced traveling down the road. The system allows on-site leveling in the left and right mode, while setting up at an un-level campground site. The Americana fitted with the air system would be able to be leveled in both front to back and left to right planes. 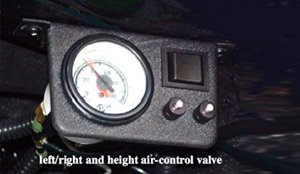 The system has a high pressure air pump, air reserve tank and is available with a quick disconnect to allow you to "air up" all your tires from the air pressure system. According to our professional delivery drivers as well as Americana owners, the air-ride system is even smoother and has more towing dynamic dampening than theAlko system. The fully adjustable air-ride suspension helps eliminate adverse towing dynamics caused by opposite inertial towing moments exhibited when the load always tries to go in one direction and the tow vehicle another. Rough roads amplify this dynamic. Example of the negative towing dynamic: You have most likely either seen or owned a slide-in camper where it was necessary to install "bounce away" shocks between the front of the camper and the front fenders of the truck. The shocks were an effort to dampen the jerking motion of the load moving against the direction of the truck. The same negative dynamic raises its ugly head when a tow vehicle pulls a trailer or fifthwheel over rough or wavy roads. Our new adjustable air-ride suspension installed on a GS34/35RL makes railroad track crossing feel like it isn’t there (shown on our home Video CD). What magic!! Adjustable trailing arm air-ride for your tow vehicle's rear suspension would also be a very nice contribution to creature comfort on rough roads. Towing an Americana with the new adjustable air ride has been likened to traveling down the road in a big 1/2 million dollar Diesel pusher class "A" motorhome only with a pickup truck. Here is a copy of an email report from Bob and Kay Doiel about the performance of their new adjustable air-ride and hydraulic disc brake upgrade option. Bob and Kay Doiel were enroute from Elkhart to their home in Colorado with their new GS34/35RL. 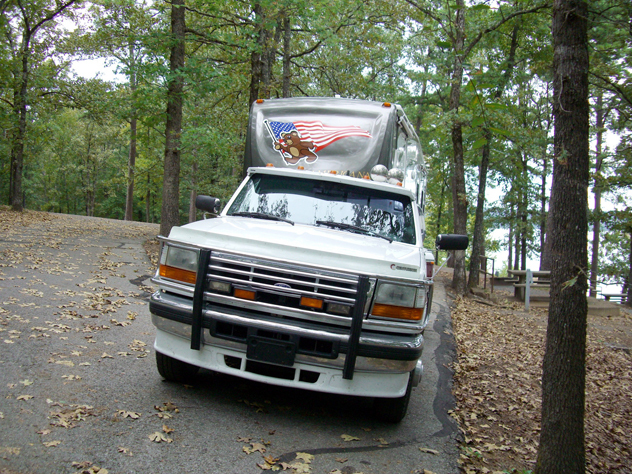 The Doiel's tow vehicle is a 3/4 ton Dodge Diesel, custom cab, standard bed. 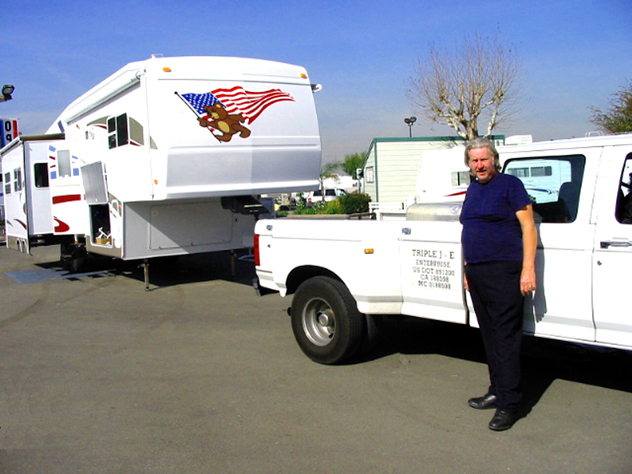 The Doiels have over 30 years RV towing experience. The Doiels sold their smaller Americana ‘99-29RL before picking up their new GS34/35RL triple-slide in Elkhart, Indiana. WOW! Bob set the air at 50 lbs. and I rode in the 5th wheel this morning. It was great! I was able to set on the couch and read my book with no problem. There was very little side to side motion, even over some very rough sections of the freeway. I was impressed with the way things have ridden. They stay where I put them (the Bear rode on the desk today). I moved up to the bed for awhile to see how that was. I've ridden in the back of our other trailers quite a few times and it was never as smooth as this one. I'm very impressed. Tonight, Bob used the air suspension to level the trailer once we were parked in our RV space. It worked great, we didn't have to put boards out and try to judge how many we needed. While we were driving through St. Louis today, traffic suddenly stopped in front of us. Bob put the brakes on real hard and we were able to come to a stop in a smooth, controlled stop! The disk brakes worked wonderfully! We didn't hop, skip, or jump. We just came to a STOP! Next time we will try 60lbs and see if I can tell any difference. Bob is having trouble finding anything that he would change (and that says alot!). Earl Weldon, our most experienced professional transport driver said, after towing the GS34/35RL 2350 miles, that “it was the smoothest fifthwheel he has ever towed”, and he thought the installed hydraulic disc brakes were wonderful!